I was genuinely curious about WWII and India when I selected this book. A few years ago, I had a conversation with a guy from India and he didn't know what D Day was. He said that there was so much history to be learned about India that they didn't learn so much about world history. I didn't understand how such a major world event could be overlooked by a country. Did they not participate in it? Then I started thinking that they were probably more involved in the Pacific Theater which outside of Japan bombing Pearl Harbor, we don't focus much on. From the description, I thought the book would involve WWII more. But actually, it is a very small part of the story. Myshkin is now an old man and he is trying to come to terms with his childhood by recording his memories. The story begins quite a while before his mother left with the "Englishman" who was actually German. While from a cultural standpoint, it was somewhat interesting, I found the first third of the book slow and somewhat hard to get through. A lot of time was spent introducing the characters and the various family dynamics. At one point I thought this is not what I thought the book was about. Politically the focus was on British rule and India's bid for independence. Even with the introduction of Walter Speis and Beryl de Zoete, there are only brief mentions of what is going on in Europe and the eventual declaration of war by India. 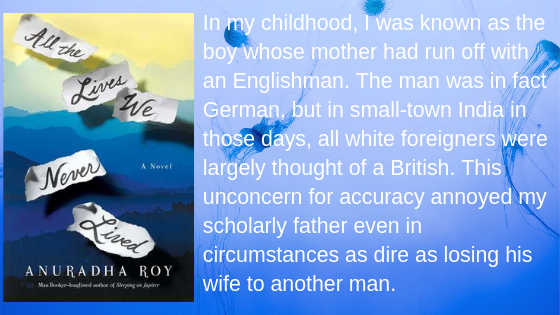 The story is really about a man reconciling his childhood in which first his mother and then his father abandoned him (though the father returned the emotional abandonment continued as his father became more involved in the Indian rebellion). Through Myshkin's memories and eventual letters his mother wrote to the neighbor next door, it is also a story of individual freedom, particularly for women. I think this latter storyline was the most interesting and made the last two-thirds of the book more enjoyable and read quickly. I found particularly interesting how vehement Nek (Myshkin's father) is about India's freedom from England, yet restricts more and more the individual freedom of his wife. I liked the characters, each was unique and well rounded. By the way, Walter Spies and Beryl de Zoete are real people, though it seems Roy has taken liberties with their visit to India. I found it interesting when I read the Acknowledgments at the end that Roy was researching Walter Spies. "The point at which I knew this book was going to be written came one afternoon on a street in Ubud, Bali, when Rukun Advani and I were drooping in the heat, on the brink of giving up the search for Walter Spies's second home." From this, you would think that Spies would be a central character in the story. While he is a pivotal character in the plot, he is a secondary character. I liked Roy's writing style. And while I thought she might have spent too much time setting up the story, she definitely made an emotional connection between her characters and the reader. I'm not surprised she has been nominated for the Man Booker Prize (for Sleeping on Jupiter). 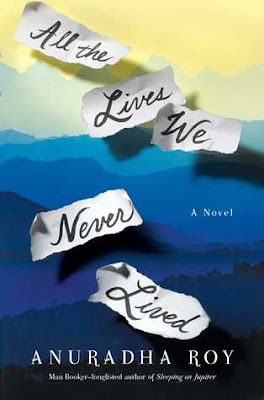 All the Lives We Never Lived is a fine literary novel. If, like me, you are looking to expand your reading horizons this would be a good choice. Linked to First Chapter, First Paragraph at I Rather be at the Beach. This sounds good, and I love the cover! This really sounds like an interesting book. I do like the sound of this one. I'm curious for more. Enjoy.